Simple explanation and exercise to introduce the first conditional. Sentence 18 IS negative. I'll change it a.s.a.p. Copyright 11/8/2016 Brigitte Engelfried / Mar Blancafort. Publication or redistribution of any part of this document is forbidden without authorization of the copyright owner. Thanks, but there is a mistake in 18 part 2 it should be won't disappear. And in 13 you should add not in brackets before the word remember. In this place students are confused. I know, kristalita, you are right. I'm trying to find out how to change it. I am really sorry. It will be changed as soon as possible. Thanks :) also can you add not in 13 before word get. 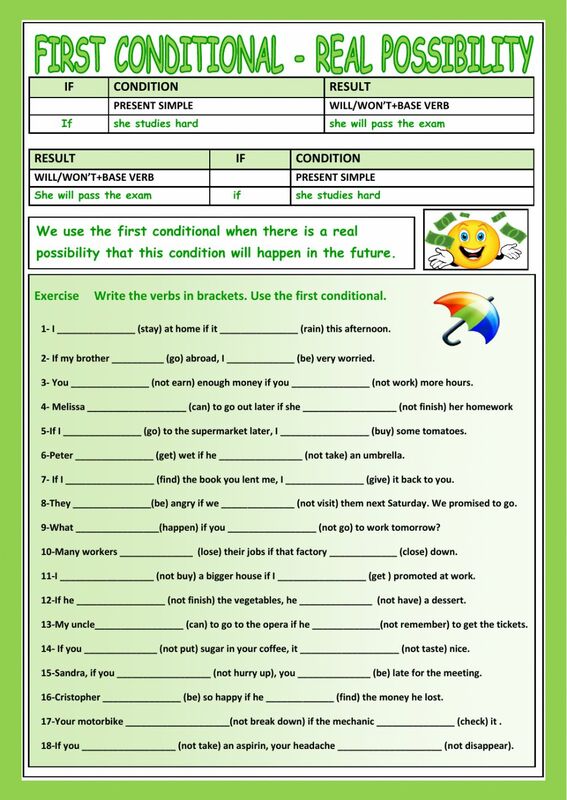 I like this worksheet a lot, but I would suggest some corrections: 1--Item 11 should have "not get" in the second set of parentheses, or students will be confused as to the intended meaning of the sentence, because the speaker might be saying he/she will not buy a bigger house even if he/she does get promoted. And 2--Either the directions should advise students always to use the contracted forms (don't/doesn't/won't) for the "not" responses OR the longer forms should be acceptable as correct answers. Of course, you don't want to discourage students by marking their correct answers wrong. Thanks a lot, dear teachers. Your works are so cool!! !